Do you know why Gemini is the Best Horoscope Sign? Ruling the skies between the 22nd of May and the 21st of June, Gemini is the third sign of the horoscope. It is a highly diverse sign, mostly known for its duality, which is symbolized by the twins. Gemini can be outgoing and communicative or contemplative and serious – it all depends on their mood. Often, the Gemini Traits are not as fixed as other signs and many Geminis don’t completely line up with the description of a “typical” Gemini. Let’s see what makes the mutable Gemini the best of the zodiac cycle. The ruling planet of Gemini is Mercury, which gives them mercurial energy reflected on their talkative personality. They often have a lot to say and they always know what to say and when to say it. Gemini is the master of communication and getting the right message across to a person comes easy for them. Geminis have outstanding verbal skills, interesting opinions and they enjoy intellectual debates the most. Gemini is known for an energetic and witty personality. They manage to remain youthful even at older age. Their dynamic nature makes almost anything possible. Sometimes it seems that Gemini handles too much but don’t worry, they are great at multi-tasking. Geminis love to have a good time, but they also enjoy chilling. They can be loud, but they also enjoy quiet. Gemini’s element is Air, characterized by intellectual mind and original views. They have the ability to discuss every subject under the sun from politics and religion to travel. They look at things from many angles and they can shift from one thought to the other faster than lightning. They truly enjoy debates through which they gather ideas and information. Did you come up with an exciting new idea and you want to share it with someone? The Gemini will be excited to hear it and discuss it further. They love new assignments, variety and anything that means venturing into the unknown. Because of their inquisitive and curious minds they love to learn about new subjects. This keeps them from their biggest enemy: boredom and stagnation in life. The multi-faceted Gemini never stops surprising. Even the closest ones around them can never know what to expect from the unpredictable Gemini. People born under this star sign have the ability to surprise their peers at every step in life. With their versatile personality they are fun and often they are in the center of the group, entertaining everyone, making them laugh, having a good time. Gemini is bold and funny, with the quality to fill a room with laughs. Often they have an ‘evil’ sense of humor as they are masters of sarcasm. They will point out all your failures and laugh about it, but don’t take it personally. The good thing is that they make you laugh along with them. This trait lightens the mood in the surrounding and also keeps the Gemini amused and satisfied. 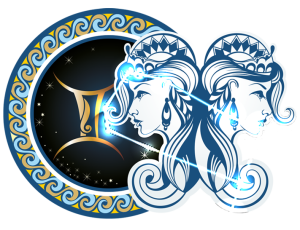 Gemini symbolized by the twins, are two-faced or perhaps even multifaceted. For some people it might look like multiple personalities, but it is not exactly the truth. The Gemini has multiple interests! This highly diverse and mutable sign enjoys various situations and people. Life with a Gemini is never uninteresting or boring. Geminis always have something to share with their partners! Geminis are often seen flirty, but when they are devoted, they are very faithful and giving. Gemini man is one of the most courteous man you will come across with – they are the types to open doors, send flowers and pull out chairs. They will spoil you, will go all out and bend over backwards for you. When a Gemini loves you, there is nothing he or she won’t do for you. Geminis know how to play the social game, and they will rarely struggle at engaging with new people. On their best behavior they are friendly and well-mannered. They are the ultimate social butterfly. Even though Geminis are often called out for their flirtatious nature, they flirt harmlessly. Gemini can easily adapt to all circumstances and their calm, positive attitude is an irresistible lure to everyone they come into contact with. Possessing a natural charm and great social skills, the Gemini woman is well equipped to successfully take on the challenges of life.